Qolşärif Mosque – variously Qol Sharif, Kol Sharif, Qol Sherif or even Kul Sharif – was built in 2005 on the site of an earlier mosque destroyed by Ivan the Terrible’s forces in 1552. 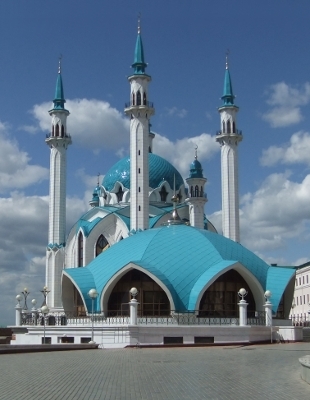 It’s reputedly the largest mosque in Russia and the largest in Europe outside Istanbul. This entry was posted	on Friday 23 September 2011 at 13:59	and is filed under 2011. You can follow any responses to this entry through the RSS 2.0 feed. You can leave a response, or trackback from your own site.